2016 is here, can you believe it? Happy New Year! Although I try to keep Christmastime and the days leading up to it pretty low key in our home, December turned out to be a busy month for us. I traveled to Chicago right after Thanksgiving for the Bernina Ambassador Reunion and learned so much about Bernina, their awesome family and several of their machines. I have always loved the Bernina brand and I am so thankful to have had that experience. I love Bernina!! Then, a few weeks later, we were off to Long Beach for a few days. What a great trip that was! I did a ton of sewing in December and I'll save those project pics for another post! Both the Duke block and the Apple Blossom are 9" blocks and they look great together. 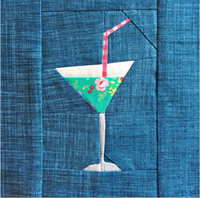 Here's an example of a quilt layout you could do with those two blocks. In fact, I designed the Duke block for my friend Vicky and several of us made this quilt for her and it turned out fabulous! To all of you in the US, I hope you have a wonderful Thanksgiving!! First, Kerry and I are offering 30% off all our Sew-Ichigo patterns! And Gah!! Look at this free lavender bag tutorial by Kerry using the Christmas dress pattern in our Christmas set! 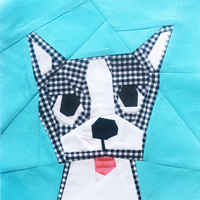 I fell hard for Melissa's pieced face quilt as I watched her progress on it on Instagram. Then when she posted that it was going to be on display at QuiltCon and she was going to be there as well, I had high hopes of meeting her! Although our paths didn't cross at QuiltCon, fast forward a couple of months, and after a bit of back and forth, Melissa agreed to come to my house in Colorado for a weekend of teaching and a slumber party with a wonderful group of women I had in mind (she wrote a bit about that process here). Melissa (and her teaching methods) are brilliantly mindful and thoughtful. I really had no idea what to expect, although I had a few preconceived ideas based on the supply sheet. The class started with a lesson on face drawing. If you take a look at my before the lesson drawing compared to my after lesson drawing, you will see that her methods are very effective. By the time we had practiced our face drawings for a bit, we were all restless to get to work with some fabric. Melissa encouraged us to work on a couple of faces at a time and not get too attached as we worked. I love how this method kept my personal need for perfection in check. I'm still working on redhead, and I'm fortunate that Fozzy hasn't discovered all those pieces on my designboard are not yet tacked down! Here's the other face I started. I've started grid stitching her and will keep you updated as I get further along. I love this photo, it's really uncanny how much everyone's faces resemble the maker in features or personality. And then the proud (as she should be) teacher in the front. Thank you so much Melissa for investing in us, we are so grateful to you and I'm so excited to see where the Making Faces journey takes you! You're an absolute treasure! Amy is hosting her second round of Texting While Sewing and this round includes a zipper! She has tons of fabulous prizes lined up and guess who is the guest judge?!!! You can find all the contest details here! Good luck!! This last weekend was amazing, with a visit from Melissa Averinos! I have so much to tell you all, but that will have to wait until later this week. Until then, the winner of the Good Neighbors charm pack is Beth T. that said, "What a cute idea, to crochet the backing. No matter how many people do the same thing--make a pin cushion, for example--there are still so many ways to make it one's own, and darling." Beth, email me with your address and I'll pass it along to Connecting Threads!